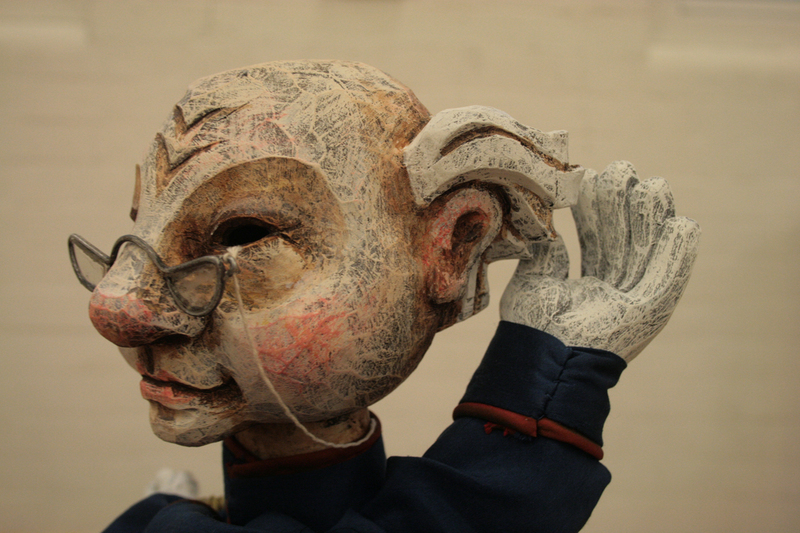 As a part of my ongoing exploration of puppets and puppet-makers here at the Artlog, today I offer an interview with the Czech-born puppet-maker Jan Zalud. Above: heads and hands of villagers carved by Jan Zalud from designs by Lyndie Wright for A Very Old Man with Enormous Wings, a co-production between The Little Angel and Kneehigh Theatre. C.H-J. Jan, you were born in Prague, a city synonymous with puppets. 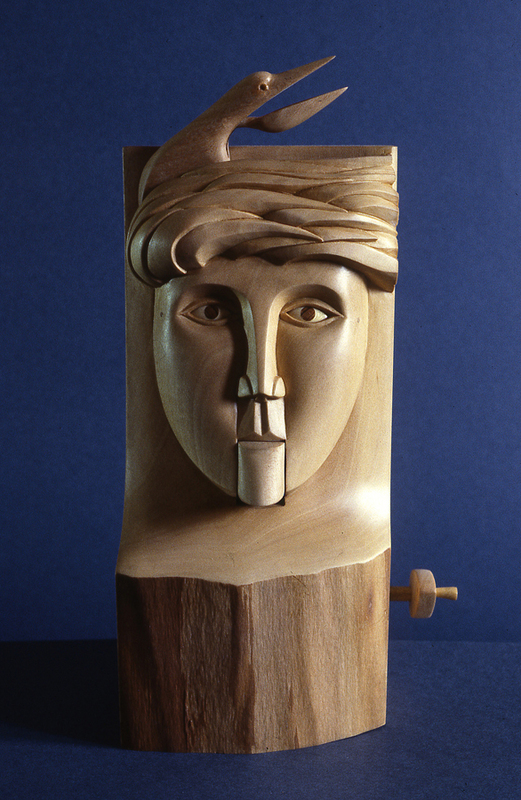 Are there other members of your family who are wood-carvers? J.Z. There’s no tradition of wood carving or art in my family, they are mostly scientific or business-minded. C.H.-J. I confess to a prejudice. I don’t really think it’s puppet-making if it’s ‘modelled’ rather than carved from wood. There’s nothing that feels like wood under the hand, or that operates like it, or weighs the way wood does. J.Z. I can sympathise with that. 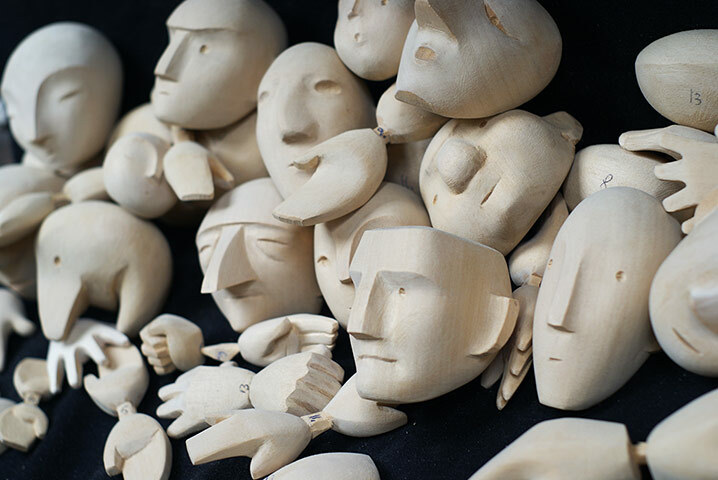 A wooden puppet feels traditional, and is handmade. If it is carved as opposed to cast it is unique. Wood is just a fantastic material to manipulate, it can be shaped as you wish, has a warmth to it and of course is very durable. C.H.-J. When I first visited Prague about fifteen years ago, I’d imagined I’d find puppet theatres on every corner. In fact there were a very few, and during my time there I couldn’t find performances of anything other than Don Giovanni. (In much the same way, while there were students at most corners selling tickets for music events, every concert was giving Vivaldi’s Four Seasons.) Undoubtedly tourism, while vital in economic terms, has a way of reducing any culture to what may more readily be packaged and sold. Outside one theatre were photographs of a fabulously beautiful production of Orpheus and Euridice, but when I enquired at the ticket office I was told that no-one wanted to see such things any more, but they had tickets available for Don G.! J.Z. I left Prague when I was a kid and and on my return as an adult my experiences were very similar. However I did find a couple of fantastic shops under the Charles Bridge selling unique hand carved marionettes. 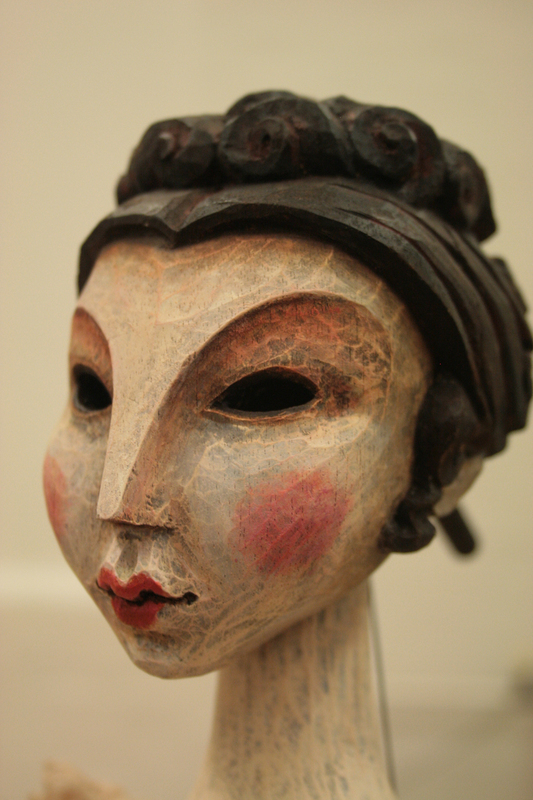 These are one-offs made by the leading carvers and are usually hand stained and painted. They command fairly high prices. There are numerous other shops selling small cheaper puppets that are good in their own way but tend to be more mass-produced with plaster-cast heads and hands, and basic bodies. Nice costumes though. C.H.-J. I have friends in Prague and no doubt I’ll be returning. Where do you suggest I might go to get more of a sense of the real tradition of Czech puppets? (And where they’re not playing Don Giovanni!) In Brussels recently I attended the Toone Theatre, still giving the old repertoire in Bruxelloise with magnificently battered vintage puppets operated by wonderfully skilled young puppeteers. (They perform in English too, but we attended performances in Bruxelloise for the full, if occasionally bewildering experience.) In Brussels there is a society of Toone ‘Chevaliers’ consisting of enlightened business people who raise funds to support the tradition of marionette performances, which might otherwise struggle to survive. J.Z. As a child I rembember seeing ‘Spejbl and Hurvinek’ shows. They are two stereotypical characters – a slightly dopey father and a cheeky, enterprising son respectively, both with huge ears and goggly eyes. In the past they were often used as figures of fun, and to comment on politics, but they could also be enjoyed purely as family entertainment. 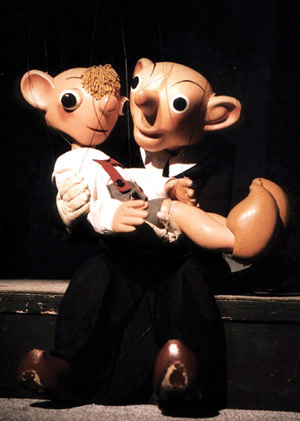 I’m afraid that returning as an adult I only ever got to see Don G.
Below: Spejbl and Hurvinek, puppet characters created in 1920 by Josf Skupa, and in various incarnations well-loved by generations of Czech children. C.H.-J. There’s a tradition that some puppet-makers are also puppeteers, though that’s not a given. Do you perform as a puppeteer? I see that you played a rather Tevye-like puppet-maker in Joe Wright’s marvellously theatrical film of Anna Karenina. J.Z. I’m not a natural performer and I very much prefer to stay in the workroom. The skill of puppeteering is well beyond me. I did have a miniscule role as an extra in Anna Karenina as a lowlife puppet maker. I had a great costume and it took them an hour and half to make me look grubby enough. I sneakily managed to carve a set of hands for the Little Angel Theatre while in the background of a scene – and most likely out of focus. Getting paid twice for the same bit of work! Above: Jan in make-up for his role as a puppet-maker in Joe Wright’s acclaimed film of Anna Karenina. 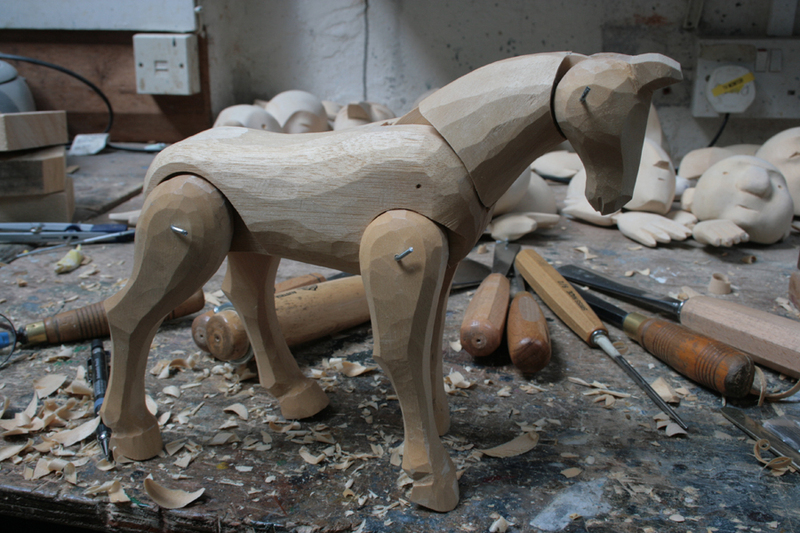 Below: a horse puppet carved by Jan that Anna, played by Keira Knightley, purchases for her son’s birthday. C.H.-J. 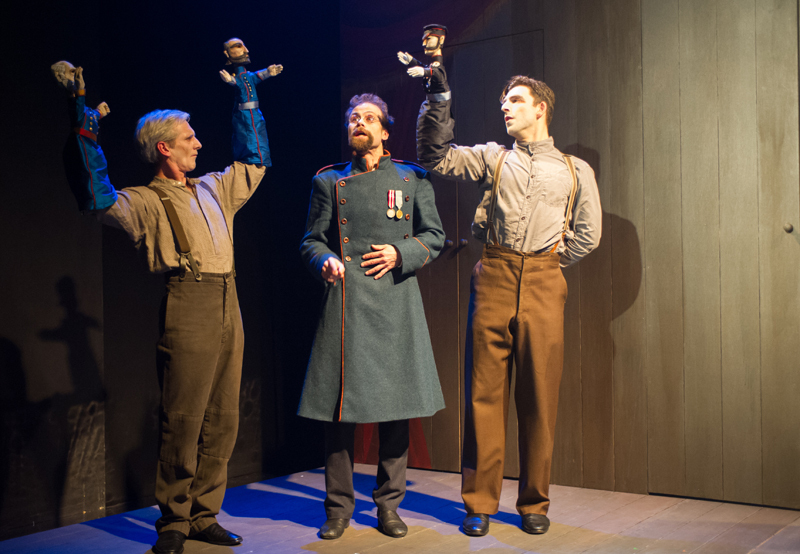 Last year you made some Lyndie Wright-designed puppets for The Double at the Ustinov Studio, Theatre Royal, Bath. How did that work? Were puppeteers brought in for the production, or did the actors have to learn how to be puppeteers? I’ve worked with some actors who take to puppets like ducks-to-water, and others who are completely incapable. 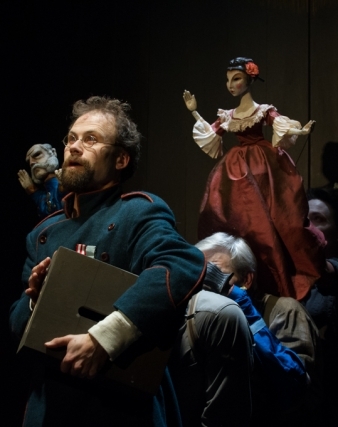 Below: puppets for The Double by Fyodor Dostoevsky. Designed by Lyndie Wright and carved by Jan.
J.Z. This was one of the most enjoyable jobs I’ve been involved with recently. In this particular instance I was able to really explore the carving leaving the texture heavily tooled with the final chisel cuts being quite bold, yet still fluid. This production was largely live action with glove puppet sequences. I think the actors had no prior experiences of operating, and had to be trained specifically. Sarah Wright was the puppet director and did a great job in tutoring the actors not only in the movement but also in the way the puppets interacted with the action and the other actors. 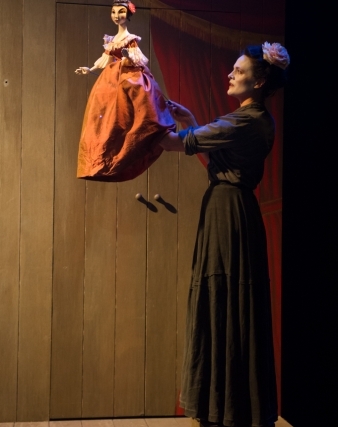 As an example: at one stage a puppet had to pass a written poem to another actor. The sequence lacked something until she gave directions for the puppet to not only hand it over but to slowly follow the piece of paper with his eyes. Such a simple thing yet it transformed the scene instantly. Below: puppets for The Double in performance. Photos by Jane Hobson. The Double, by Fyodor Dostoevsky, was adapted and directed by Laurence Boswell for the Ustinov Studio, Theatre Royal, Bath. Puppet direction was by Sarah Wright. The actors/puppeteers were: Simon Scardifield, Rob Edwards, Jane Leaney, Nicholas Karimi and Sean Murray. C.H.-J. I’m soon to start directing The Mare’s Tale, a new chamber-work with narrative commissioned by Mid Wales Chamber Orchestra from composer Mark Bowden and librettist Damian Walford Davies. I’ve designed and made the puppets. We filmed them to see how they were looking, and I was staggered when the conductor James Slater picked one up and worked it like pro. He’d never handled a puppet in his life before, but he just got it. He played to the rehearsal mirror without even being told. J.Z. From the images I’ve seen so far it looks like an exciting project, I’ll certainly look forward to seeing how it progresses. C.H.-J. You work with Lyndie a lot, and I can see that you have a real feel for realising her designs. I performed at the Little Angel myself over forty years ago. I was a puppeteer with the Caricature Theatre and we gave some performances there. You’ve worked on some wonderful productions recently, including a Little Angel/Kneehigh Theatre collaboration. I didn’t see it, but the reviews for A Very Old Man with Enormous Wings were ecstatic. Good gig! 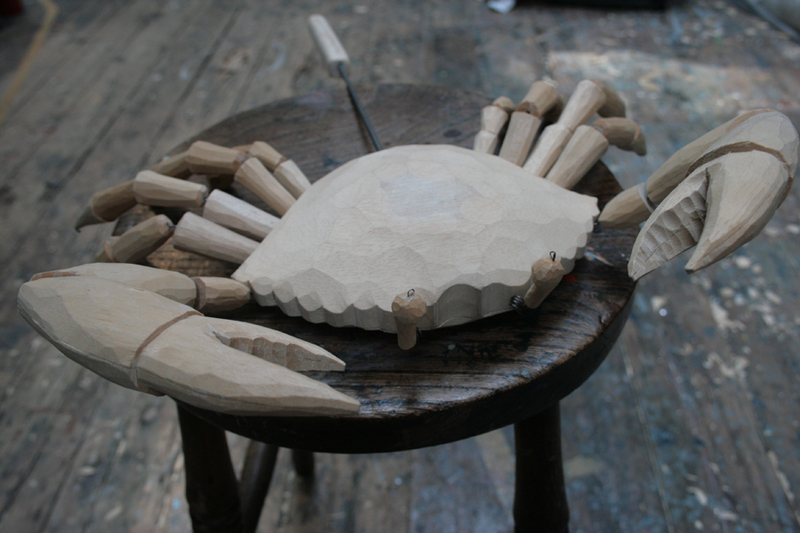 Below: crab puppet carved by Jan from designs by Lyndie Wright for A Very Old Man with Enormous Wings, a co-production between The Little Angel and Kneehigh Theatre. J. Z. My work with Lyndie at Little Angel Theatre goes back to the days under the directorship of Christopher Leith. I still find it exciting to bring to life her 2D designs – and I think Lyndie enjoys seeing my interpretations. 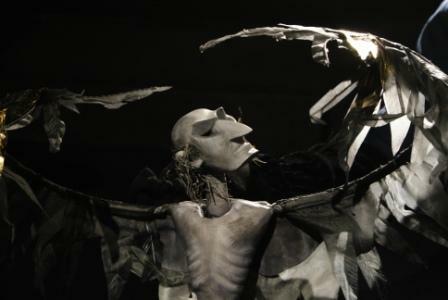 In A Very Old Man with Enormous Wings she herself carved the six main puppets including the Old Man himself, an absolutely stunning piece of sculpting with hard, strong features and a gentle expression. 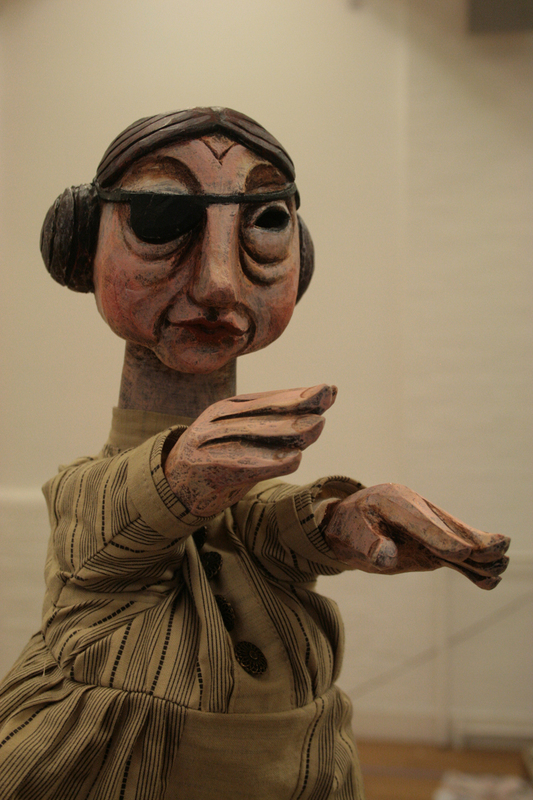 Below: Lyndie Wright’s puppet of the Old Man. On the other hand, and to me this was a highlight of our work together, was the very popular collaboration betweeen Little Angel and the Royal Shakespear Company of Venus and Adonis. In this show I had the privilige of carving the two epynomous characters. Below: puppets for Venus and Adonis designed by Lyndie Wright and carved by Jan.
C.H.-J. I’ve included some images of your automata here. They’re magnificent creations. Which came first, the puppets or the automata? Above: automaton titled Full Moon. 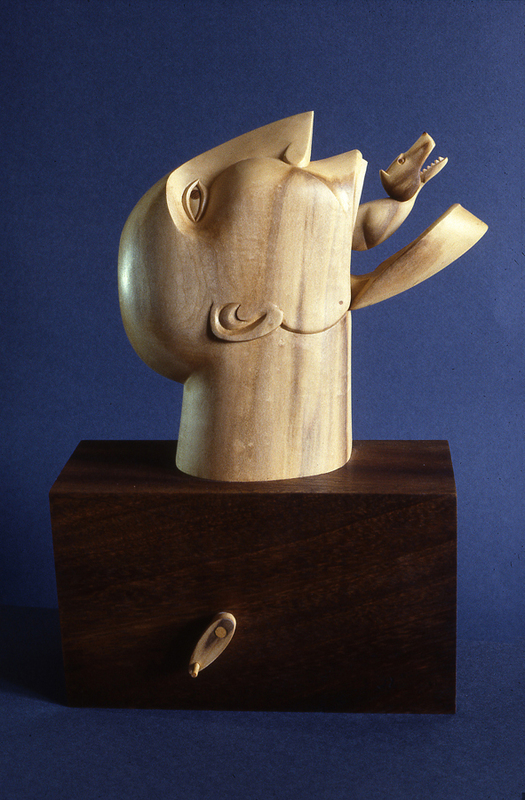 J.Z As an art student I was inspired by seeing the Outsiders exhibition in the Hayward gallery in 1979, but my own journey into carving started with some very primitive puppets assembled and whittled out of driftwood from the coast in Sunderland. I started to encase the puppets in boxes and frames, and involved the viewers by having them turn the cogs to activate the figures. The automata evolved from there. Above: automaton titled Walking in the Park. I concentrated on a recurring theme of heads with animated faces. Occasionally animals emerged from within the heads. I liked the idea of a small sculpture with an inbuilt surprise. Above: automaton titled Tour de Hat. The mechanical aspect soon became an integral part of the piece, not to be hidden but to be appreciated. Sometimes the whole point was just to create a pleasing movement. Above: automaton titled Pretending to be a Fish and Paying the Price for It. C.H.-J Jan, it’s been the greatest pleasure getting to know you. I mean it when I say that I hope we get to work together one day. You’re a ‘Maestro’! J.Z. It’s been a pleasure. 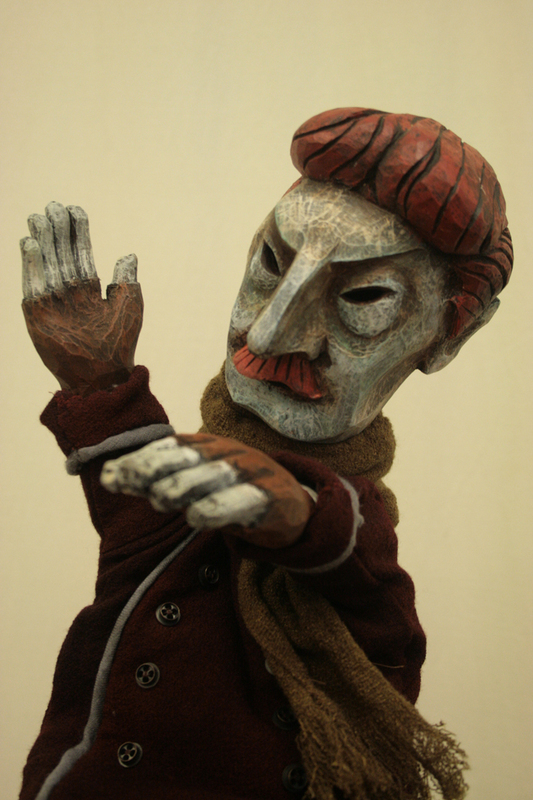 This entry was posted in Toy Theatres and Puppets and tagged Automata, Jan Zalud, Puppetry by Clive Hicks-Jenkins. Bookmark the permalink. and i must say, too, that Lyndie’s old man with wings is spectacular!! oh, oh! this is such an amazing, inspiring post! i am amazed at the wood-working. you can see the “greekness” of the faces of venus and adonis, completely distinct from the (my vocabulary shrinks to the single word: amazing) characters for Dostoevsky’s Double–and each of those with *such* expressive faces! i am just floored. 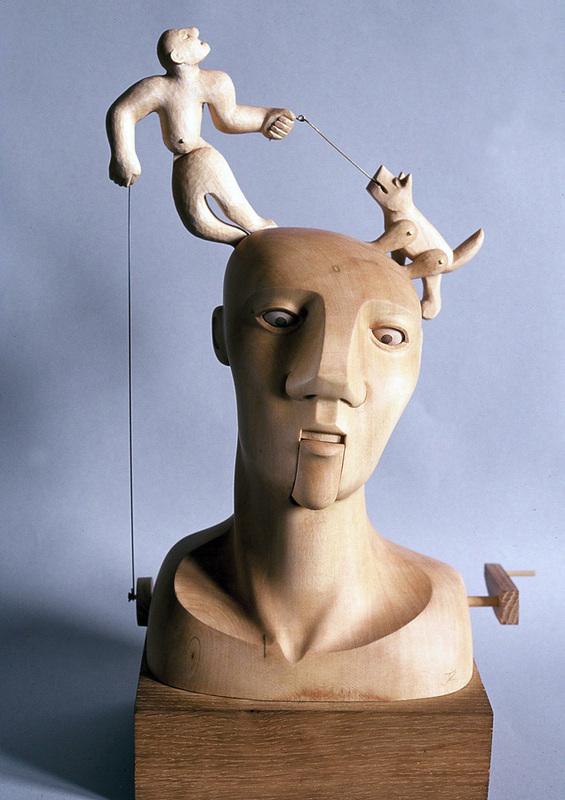 and the automata, too–a favorite topic for me. wow–thank you so much for this post, it made my day!! 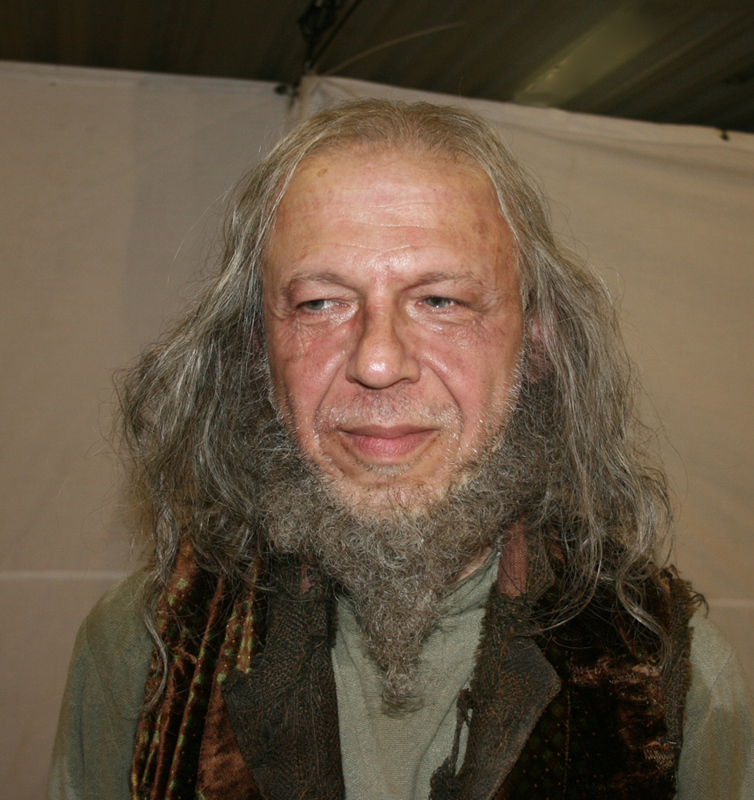 Fantastic interview Clive… Just love the breadth of his talent….The automatons are just breathtaking ..
I’m so pleased you enjoyed this post, Lyn. 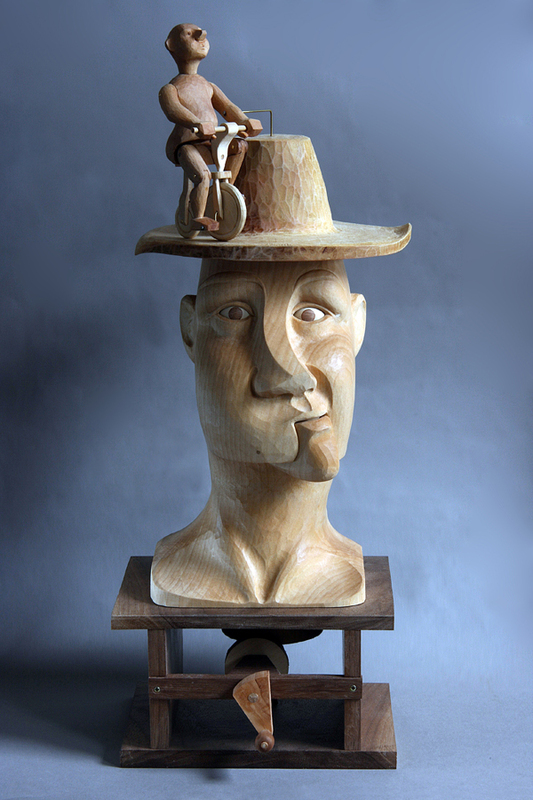 Jan is a brilliant wood-carver, and it’s been such a pleasure to see his skills as both a puppet and automaton maker. Oh Shellie, please don’t faint!!! As Jan says ‘What a pleasure!’ – it sums up this dialogue and the sumptuous photos that go with it. So much to absorb and take in. Scrolling up for a second read. You spoil us Clive. Thank you. I get the greatest pleasure discussing work with such a skilled practitioner. If you think I’m spoiling you, it should be said that I’m equally spoiling myself. Thanks for this wonderful interview and post. Great close up pics of those carved puppet heads and automata, they’re so powerful, it must be marvellous to see them in action. Magical constructions, aren’t they Phil? Wow!! What beautiful puppets, what incredibly gorgeous automata!!! Thank you so much for this interview and also the introduction to this lovely work. I hope you two get to work together in the future as well… who can even imagine what sort of things you’d come up with together! Hello Jodi. Wonderful to explore Jan’s work. He’s a master. So pleased that you enjoyed this, Liz. I loved making it. Oh my, so many beautiful puppets! What a wonderful collection Jan Zalud has created. I wouldn’t spend the night with them, but his puppets are really exceptional. Thank you for introducing me to such an amazing artist! It was a pleasure. What could be more enjoyable than getting to chew the fat with this wonderful puppet-maker? I’ve shared a room with a few of Jan’s creations. Occasionally disconcerting, but they become characters you want to see again. Like most of my mates, as it happens! Beautiful job on this piece. I think the best puppets are always a tad disconcerting. It’s that sense of hidden life, just waiting to be awakened. I certainly wouldn’t mind sharing space with some of Jan’s creations. They are wonderful objects. Glad you liked the piece. Jan is articulate about his creativity, and only needed the smallest prompts from me.